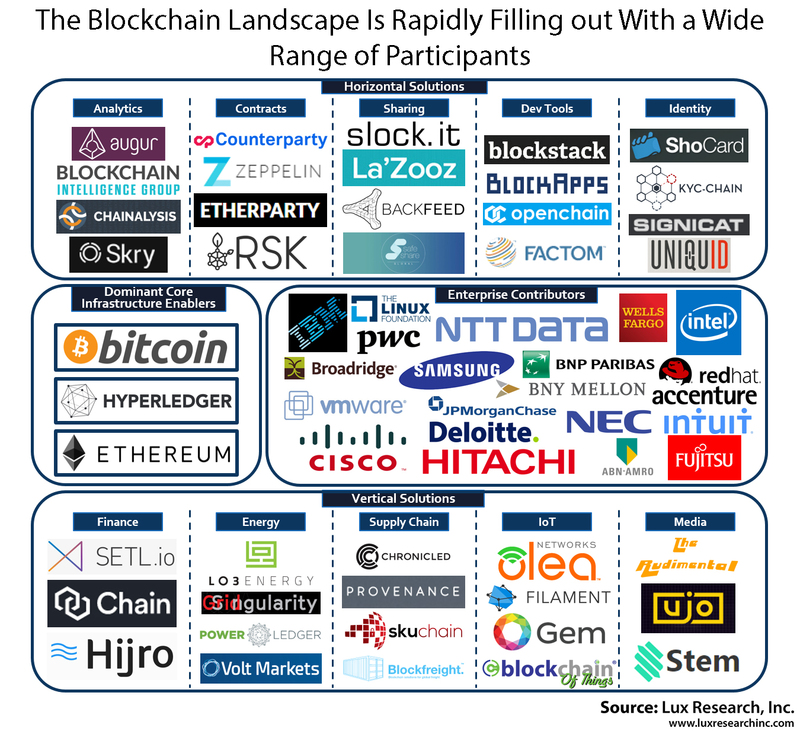 Venture firms throw billions of dollars at blockchain startups, while both startups and enterprises prepare to capitalize on the potentially massive opportunities for blockchain beyond finance. Developers are applying the approach to solve problems in power, supply chain, health care, media and many other use cases. The technology is evolving rapidly and a rich ecosystem of players is assembling. Based on interviews with industry stakeholders and extensive secondary research, we find that the power sector has emerged as an early leader for blockchain development outside of finance, with the potential to cut costs and streamline processes in several types of power industry transactions. Blockchain is a distributed database technology that securely maintains a growing ledger of data transactions and other information among participants in the network. Developers are attracted to blockchain for its inherent security, data integrity and decentralized nature. The concept of “smart contracts” is a new innovation that furthers blockchain’s value. Bitcoin was the first implementation of blockchain technology. 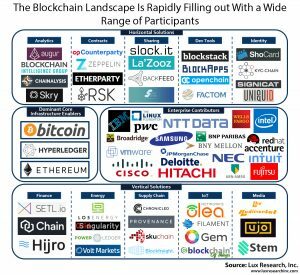 Two other major blockchain infrastructure platforms have emerged: Ethereum and Hyperledger. A wide range of products and projects are being developed on top of bitcoin, Ethereum and Hyperledger, while some choose to build their own blockchain solutions from scratch. Financial services is the most developed application of blockchain technology. 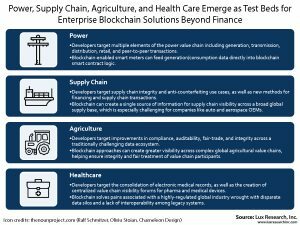 Use cases in power, supply chain, agriculture and health care are beginning to take form, while the applicability in other sectors is less clear. Blockchain still has several obstacles that lay in its path to broad adoption, including lack of talented programmers, fallibility of smart contracts, averseness to using cryptocurrencies and the increasing regulatory environment. 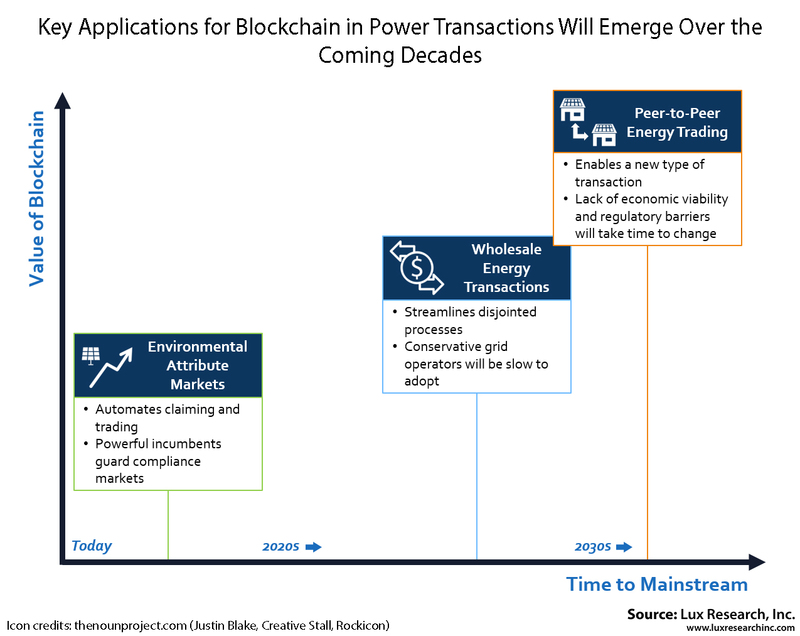 Blockchain has a lot of potential to modernize wholesale electricity transaction processes as well as the financial markets that support them. However, it faces an uphill battle against influential, conservative stakeholders, who will take a wait-and-see approach to the technology. Peer-to-peer electricity trading is emerging as a high-profile application of blockchain, allowing neighbors to sell their excess power to each other. Blockchain can provide a high-fidelity, middleman-free settlement system for these trades, but poor economics and regulatory barriers will keep peer-to-peer networks niche in the near term. 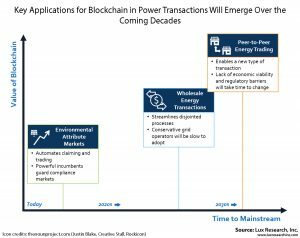 The application of blockchain to “transactive energy” — in which participants buy and sell power in small and frequent transactions in reaction to fluctuating electricity prices — closely matches peer-to-peer transactions in its value and challenges. Meanwhile, environmental attribute markets, such as those that exchange renewable energy credits (RECs), are already implementing blockchain, but only in the least-regulated applications, where both the barriers and benefits of implementing blockchain are relatively low. Blockchain is a distributed database technology that securely maintains a growing ledger of transactions (defined as transfers of data natively tracked by the system) and other information among participants in the network. Developers are attracted to blockchain for its inherent security, data integrity, decentralized nature, and its ability to simultaneously provide both public openness and effective anonymity. Bitcoin was the first implementation of blockchain, which proved its robustness and overall value. Some blockchain developers choose to build custom blockchain solutions with their own toolsets, but there are few true experts who are capable of building blockchain solutions from scratch. As such, most developers leverage the available tools from bitcoin, Ethereum and Hyperledger. Depending on the specific requirements of a given project, these three platforms have strengths and weaknesses. Bitcoin does not offer native smart contract functionality, although companies like Counterparty and RSK are trying to extend that functionality into bitcoin; Ethereum and Hyperledger both offer native smart contract utility. As mentioned, Hyperledger is the only option of the three to provide permissioned blockchains, which offers advantages for users who only admit known participants into a blockchain project. Bitcoin is widely regarded as being incredibly secure, although concern is beginning to emerge over the consolidation of the mining pools; Ethereum’s reputation is in question after the Dao situation and an ongoing series of denial-of-service attacks; the jury is out on Hyperledger as there have not been enough scale deployments. Beyond these three dominant core infrastructure providers, the blockchain value chain is rapidly becoming rich with a wide range of entities, many whom build on the core three (bitcoin, Ethereum and Hyperledger), as well as many who build their own solutions from scratch. This ecosystem includes horizontal platform solution developers, vertical solution providers and enterprises that are developing products or contributing code to other projects. Listen to a podcast on blockchain from Isaac Brown and Katrina Westerhof. While many startups and major ICT players are developing horizontal blockchain platforms, plenty of startups are developing industry-specific enterprise blockchain solutions; meanwhile major enterprises from specific verticals are exploring the impact blockchain can have on their industries. 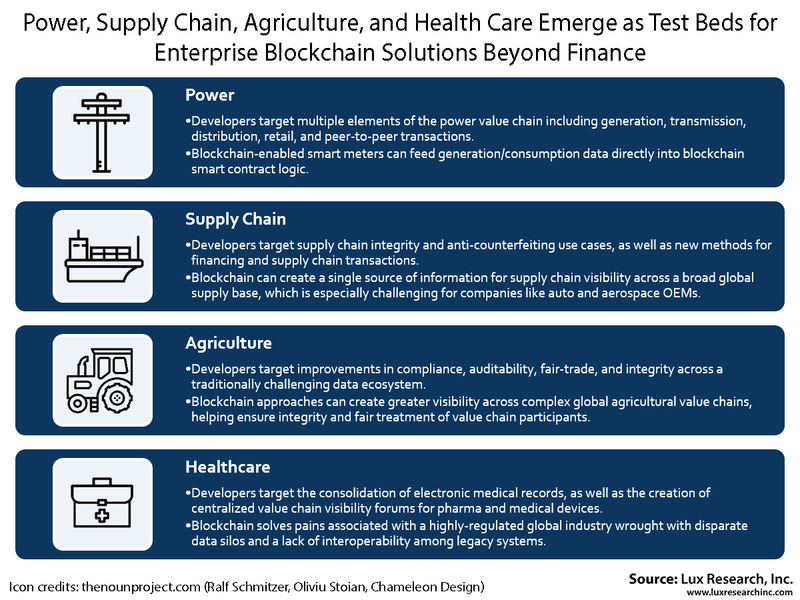 Blockchain will likely have an impact on every industry, but there are several industries where the specific relevance is beginning to take shape. Blockchain is an excellent tool for the power space, streamlining transactions that have long required manual work and enabling new types of transactions that would be impractical otherwise. Much of the compatibility between blockchain and power transactions is related to the ease of measuring electricity with metering infrastructure, which allows data and markets to coordinate in a robust way. However, power incumbents are generally conservative players that are difficult to woo or uproot. Lux Research analyst Katrina Westerhof contributed to this article.